Gibson Thick Body SG Fact or Myth? 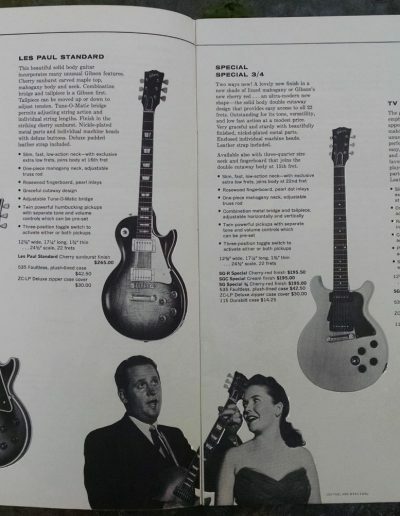 According to the 1959 price guide and my copy of the 1960 Gibson catalog, the model of guitar commonly referred to as Les Paul Special, was actually the first SG. 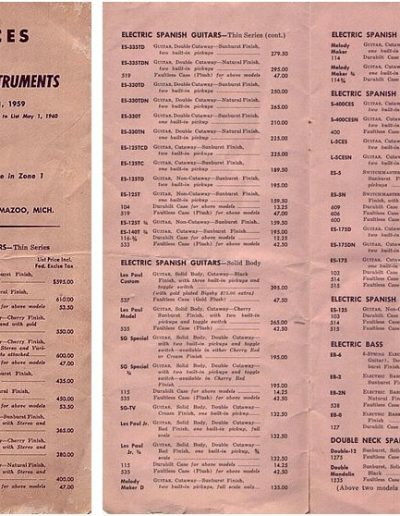 The double cutaway instrument was the same thickness as the Les Paul standard but with a non carved top. They are flat on the top and bottom. I have seen examples from as early as 1958. Single coil P-90 pickups were installed and they are mostly found in limed finish and cherry red. 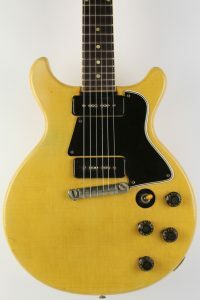 Gibson is known for it’s lack of dedication to consistency, so I expect there could be some examples of other colors out there. 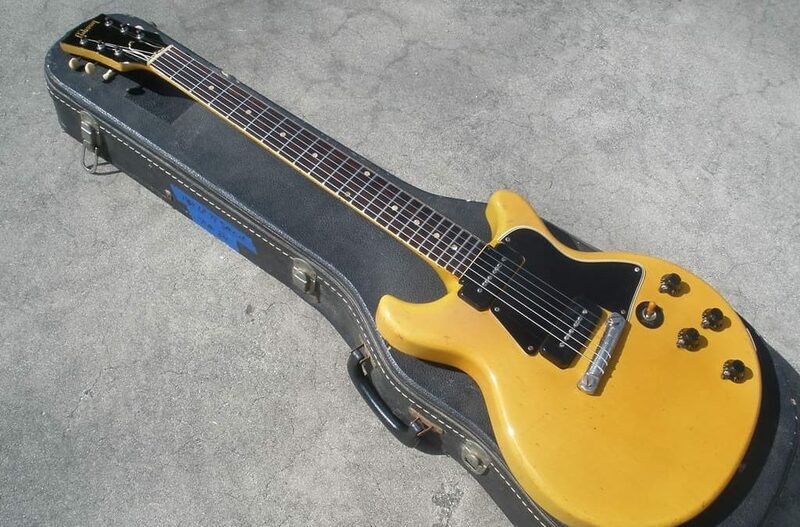 There were a few states of these fine Gibson thick body SG guitars. 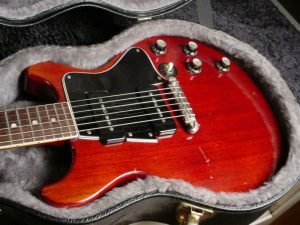 The first Gibson thick body SG had a large neck profile, body-neck joint at the end of the finger board and the selector switch above the volume and tone knobs. The neck pickup was about 1/4″ from the end of the body and the bridge pickup was also close to the angled stop tailpiece bar type bridge. The intonation was only adjustable on each end of the bridge. This worked surprisingly well however and the solid connection between the bridge and body make them sing. All I have picked up so far had pretty hot pickups. The second version had a little thinner neck. The pickup selector was moved to the area that became the standard for subsequent models. It was now in front of the volume controls adjacent to the pick guard. All I have seen of this version have a serial number that begins with 9, then a space followed by the rest of the digits. The neck joins the body the same way as the first version with the bridge pickup still very close to the end of the body. Both of these first versions had a high percentage of failure. There was simply not enough wood left in that area. Many have had repairs. 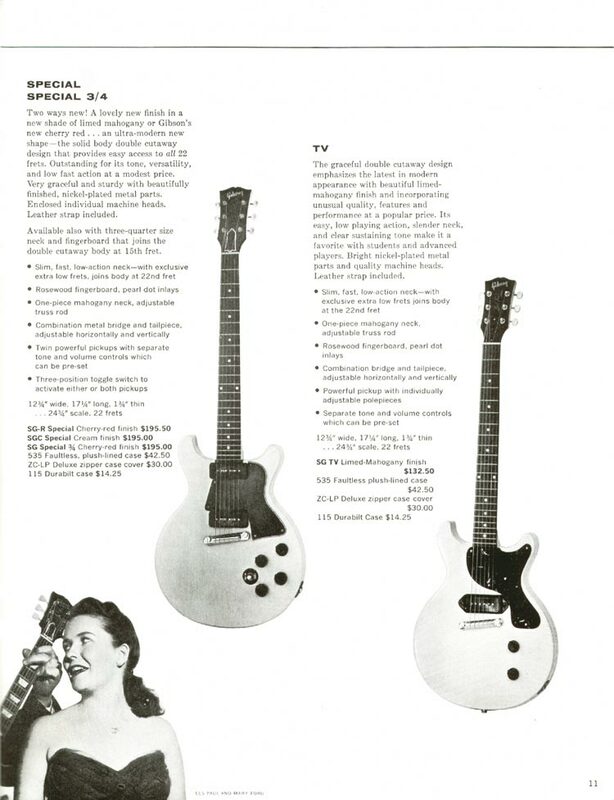 The next version of the Gibson thick body SG seems to have happened around 1960. The neck was moved into the body and joins at the 22nd fret. They had similar spacing for the neck pickup, about 1/4″ from the end of the fret board. This neck profile is my personal favorite. Thin and wide. Serial numbers were ink stamped like the earlier models with a 0, a space, then the rest of the numbers. Version 4 was exactly like the previous one except the neck pickup was moved a little further, approximately 1″ from the fret board. They used that spacing through the production of Gibson thick body SGs. 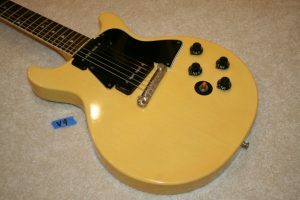 The last change to the Gibson thick body SG before extinction was moving the stop tailpiece anchors in line with each other and using a compensated bridge. All I have seen of those had pressure stamped serial numbers and were made 1961 on. The latest one I have seen was 1963. 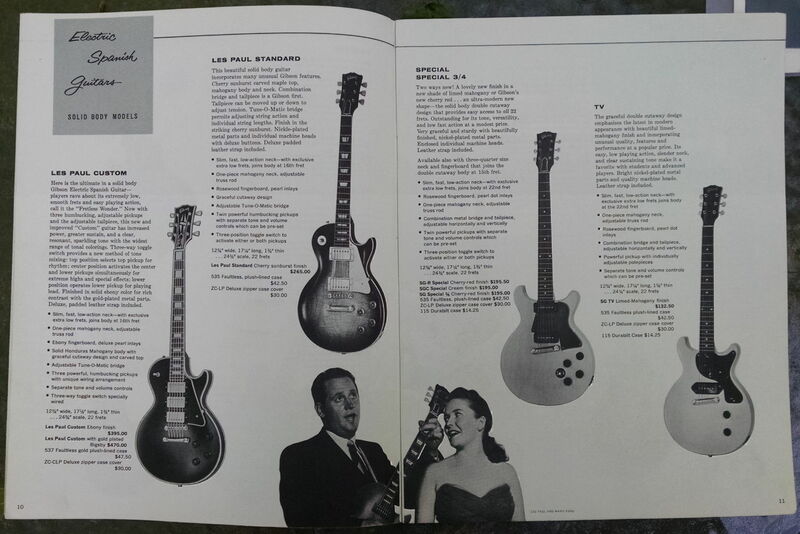 According to my copy of the 1960 Gibson catalog, the model of guitar commonly referred to as Les Paul Special, was actually the first SG. 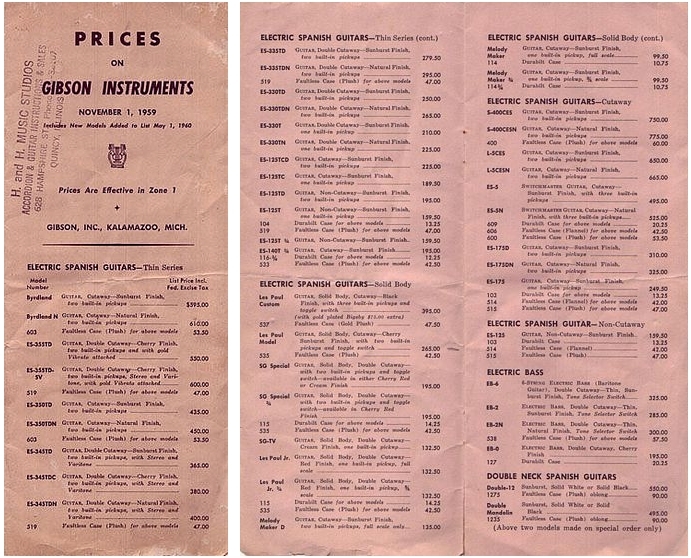 The double cutaway instrument was the same thickness as the Les Paul standard but with a non carved top. They are flat on the top and bottom. I have seen examples from as early as 1958. Single coil P-90 pickups were installed and they are mostly found in limed finish and cherry red. 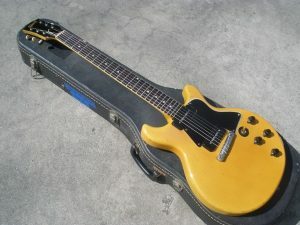 Gibson is known for it’s lack of dedication to consistency, so I expect there could be some examples of other colors out there. There were a few states of these fine Gibson thick body SG guitars.